✓ Yes, Mike! I want to profit from this fast-growing stock. I'll find out its name and stock symbol tonight … and will start a no-risk membership at the special price below. If you’re not 100% satisfied with your results in the first 30 days, just let us know and we’ll send you a a full and complete refund of every penny you paid for your annual subscription. If you join us on a monthly basis, and then wish to terminate your membership we will do so before the next monthly charge. No matter what you decide, you can keep all the special reports and monthly issues as our way of saying thank you for giving Cabot Growth Investor a try. 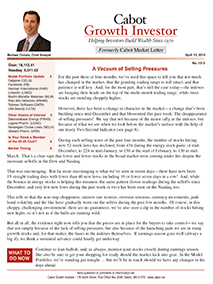 • 26 bi-monthly issues of Cabot Growth Investor, delivered directly to your inbox every other Wednesday of each month. Each issue will bring you a panoramic overview of recent and upcoming events that will affect your money and how our recommendations will benefit from these events, along with our specific buy, hold, and sell advice and updates on our past recommendations. • Weekly updates that will explain how the week’s market changes, government economic reports, earnings releases, and/or competitive technologies will affect your investments. • Complete buy, sell or hold instructions on each one of our portfolio stocks along with the full details on our watch list plays, so you’ll be ready to act when our next signal says BUY. • Personalized investor relations staff to answer your questions every day the market is open, from 9:00 am to 5:00 pm Eastern time. • 24/7 access to our private Cabot Growth Investor website. • A subscription to our free Wall Street’s Best Daily email newsletter.